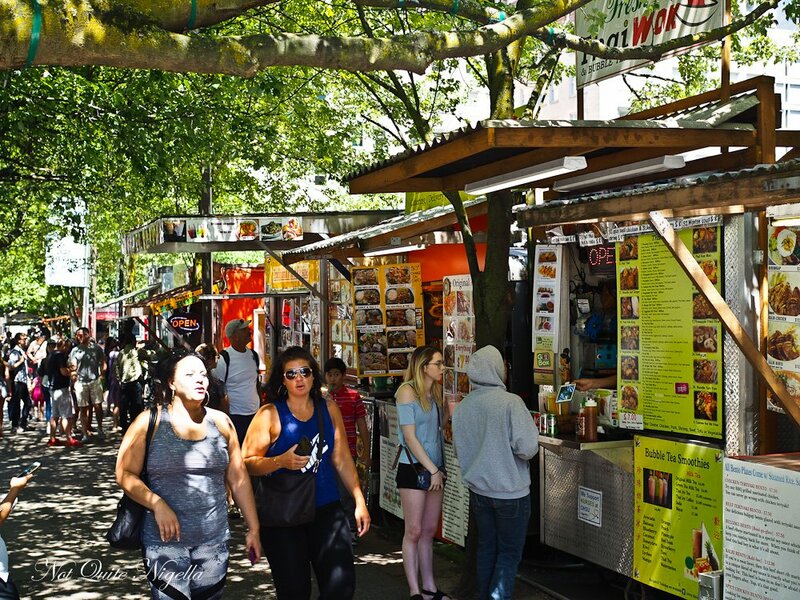 The Delicious Food Carts of Portland! 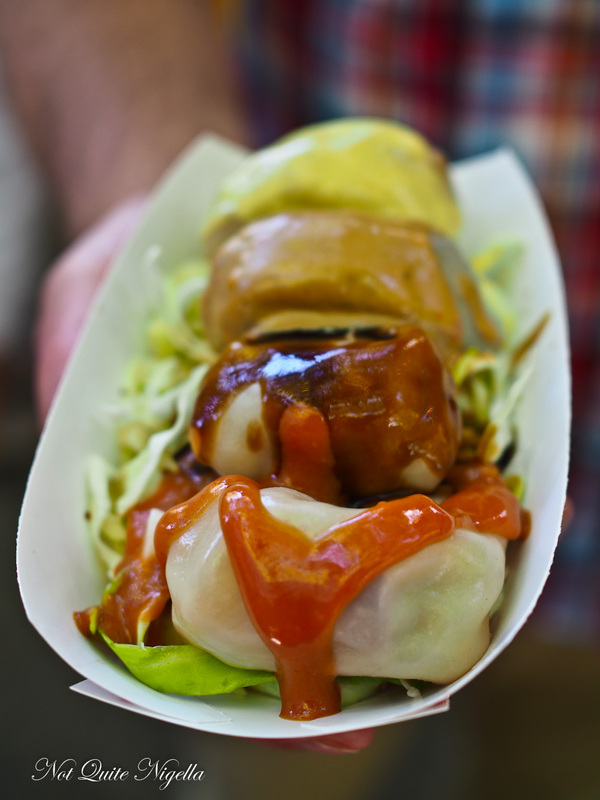 Portland's food cart scene is wide and varied. With over 500 to choose from at any one time, you can feast from all around the world to your heart's content. 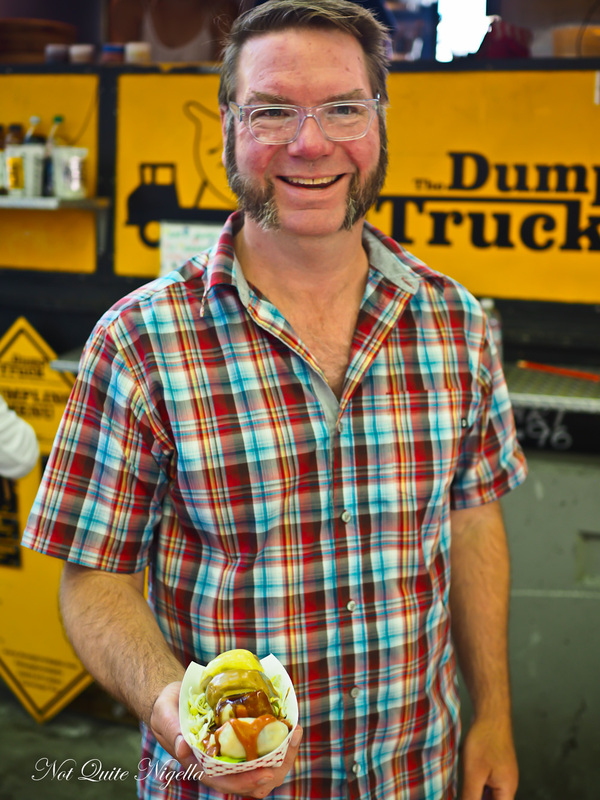 We go on a food cart tour with food cart expert Brett Burmeister of Portland Food Cart tours. Brett is waiting for us on the corner of Washington and 10thSW near 10th street and Adler. He likes this district for his food tours for the variety of food carts. Brett explains that food trucks here started in this location between 1982-1984. Food cart owners approached the parking lot owners and asked if they could park their carts on the private property. The city was not involved in the germination of these food carts and today they attract long queues of tourists and office workers looking for lunch. 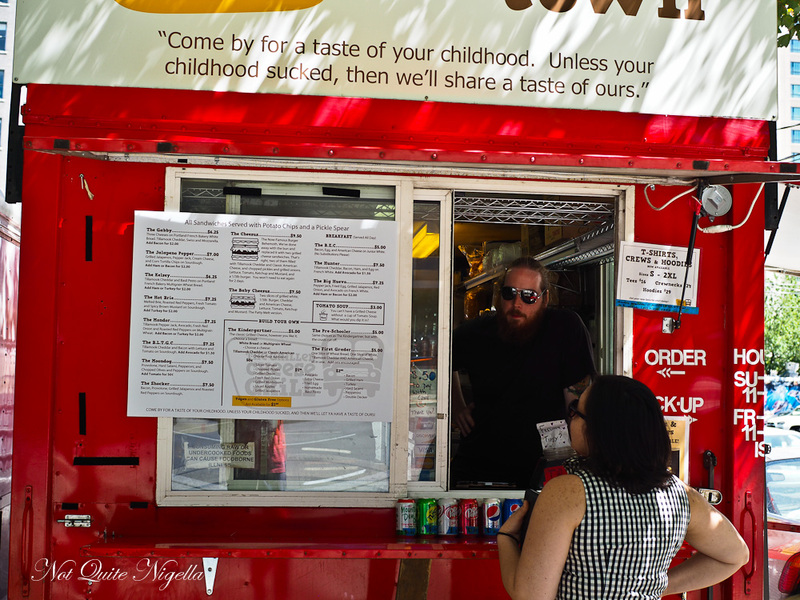 These downtown food carts mainly operate from Monday to Saturday from 11am-3pm. Brett tells us that every year about 100 close but 150 open and there is no indication of the food cart scene slowing down. 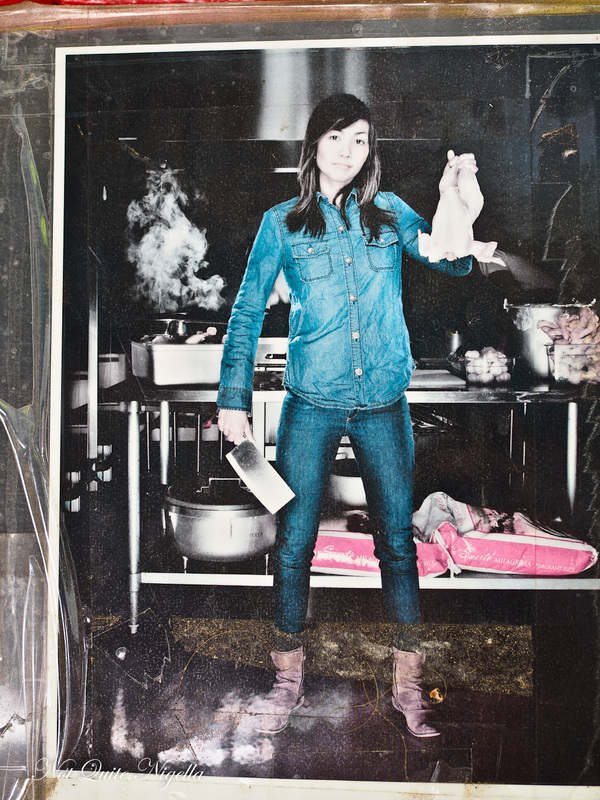 Some become celebrity chefs (like the first one we will be visiting) while other open up eateries. "Every lot has an iconic food cart. And some lots have 3 or 4", Brett says. And the iconic cart here has one advantage as designated by the queues (although Brett divulges that sometimes we will see huge queues at very average carts where perhaps people just join a small queue in the hopes that it is the next big thing). 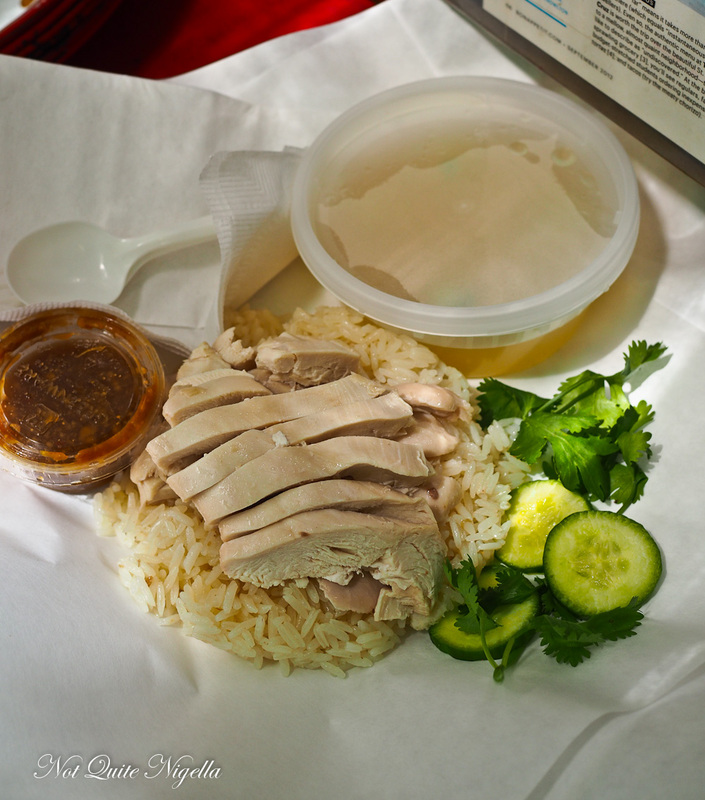 Nong's Khao Mong Gai sells one main thing: Thai style chicken and rice. Nong Poonsukwattana has become a celebrity chef in these parts competing on television shows and opening up a restaurant. The Thai chicken dish is a steamed chicken with chicken rice (not unlike Hainanese chicken rice) with coriander and a delicious garlic chilli sauce. It also comes with a container of soup-the chicken and rice are good but we love the sauce and we love the soup. Brett's tour stops change and vary according to the group and his schedule. He visits each one ahead of time so that the food is waiting for his guests when they arrive and each tour can take anything from 1 hour to 1.5 hours with four stops. 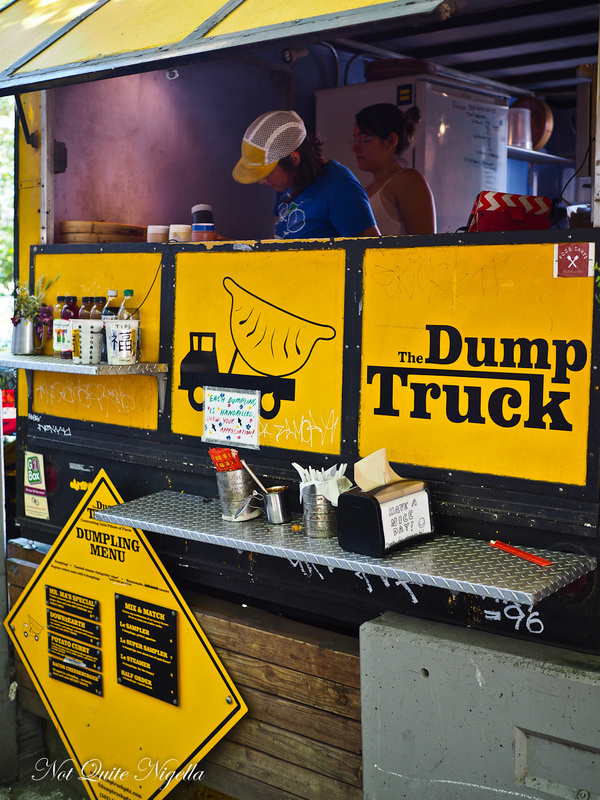 Our next stop is near to Nong's at the Dump Truck-actually dumpling truck. The food cart owners Julia and Reid lived in Beijing and a nearby restaurateur Mr Ma showed her how to make dumplings. At the Dump Truck there are four types available, all hand rolled: Mr Ma's special, Down to Earth, Potato Curry and Bacon Cheeseburger. They all come with their own sauces. I try the vegan friendly Down to Earth with portabello mushrooms, rice noodles, cabbage and ginger with a spicy tahini chili sauce-it's not bad at all. Out of the two vegan ones I do prefer the potato curry with a yellow Malaysian curry with potato, leeks and a coconut yogurt sauce. The pork classic named after her dumpling master Mr Ma is flavoured with ginger and garlic with a soy and vinegar sauce. And I have to admit that I really do like the bacon cheeseburger served with a secret sauce. 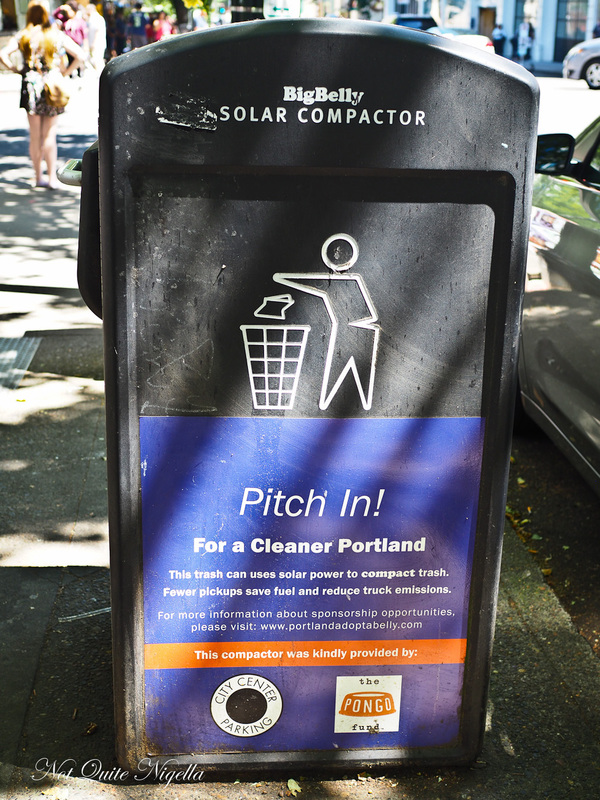 We dispense our trash in the solar compactor bins nearby and are onto our next stop: the Grilled Cheese Grill. My eyes are drawn to The Cheezus which is basically two grilled cheese sandwiches and a hamburger pattie. "If you're looking for an over the top sandwich that is it," says Brett but we go with his recommendation of a Kelsey grilled cheese sandwich which we overhear the guy behind the stand recommending to another customer. The idea behind this is to evoke memories of childhood grilled cheese and the bread that they use is from Portland's French bakery and varies depending on the sandwich. 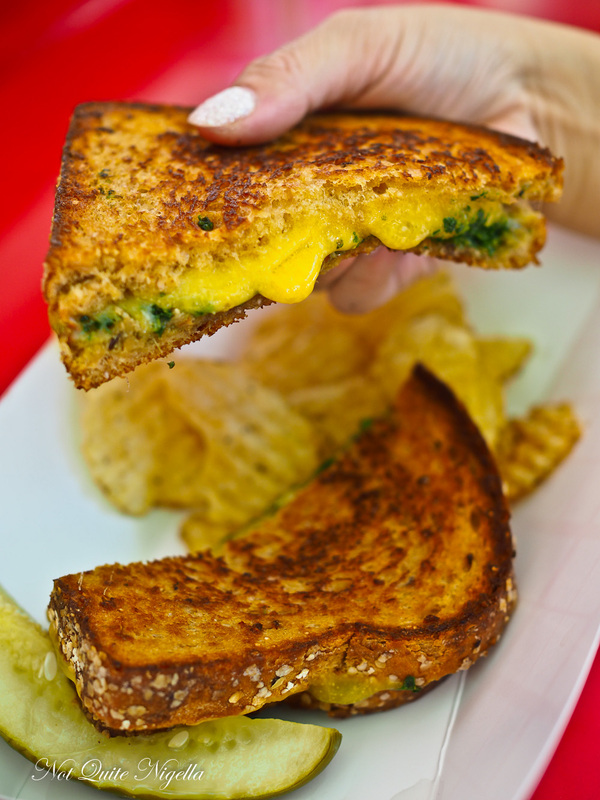 The Kelsey is made with Tillamook Cheddar and basil pesto on Portland French Bakery multigrain wheat bread. And you know what? I could not stop eating this. Mr NQN was watching me his brow increasingly furrowed as he realised he might not be getting any. "Should I take the other half?" he said gesturing towards it. 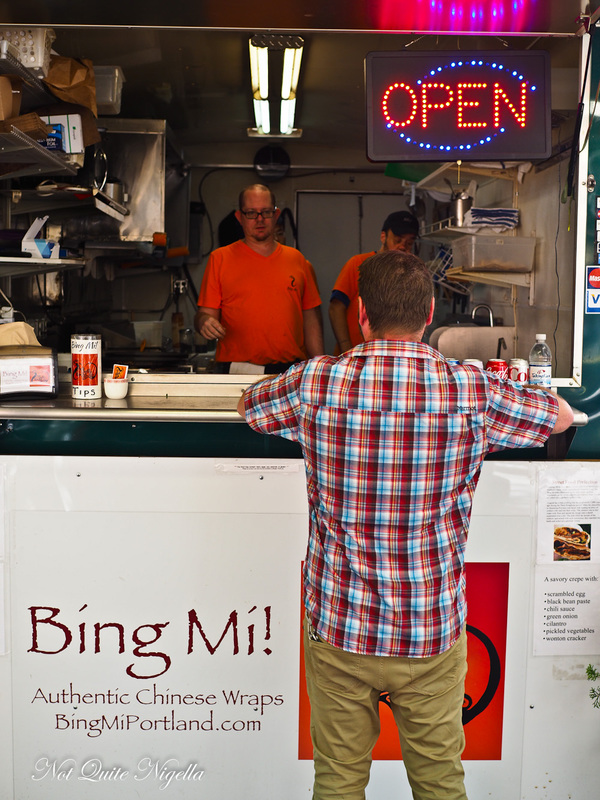 One of the newest food carts is Bing Mi that sells Northern Chinese crepes. I first tried one in Shanghai and it was one of the most irresistible things I ate. 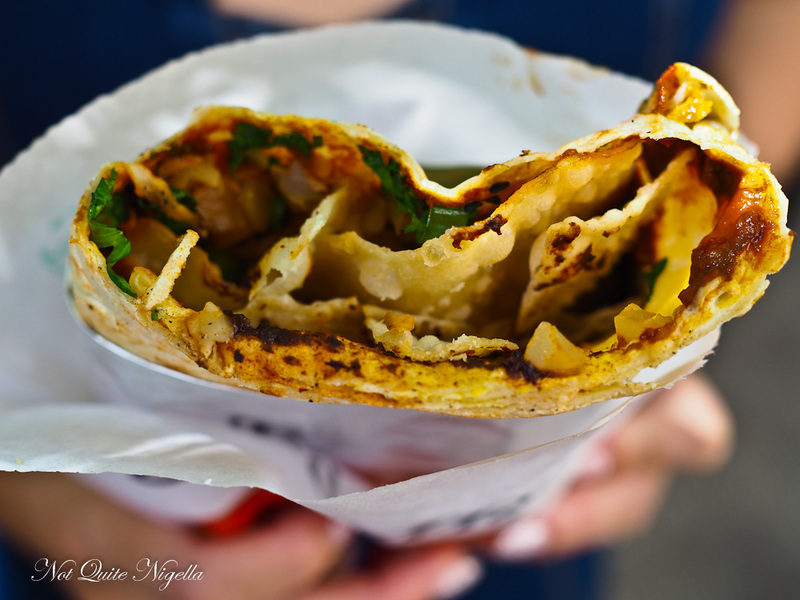 A Jian Bing is a crepe topped with a scrambled egg, black bean paste, chili sauce, pickled vegetables, green onion, coriander, and pieces of crispy fried cracker. It's thin, rolled up and not stuffed particularly full but the two halves are enough to feed two and the thing that really makes these wonderful are the pieces of fried cracker. It's not quite as moreish as the one in Shanghai but hey if you can't get there you can always try it here as they can be hard to find. 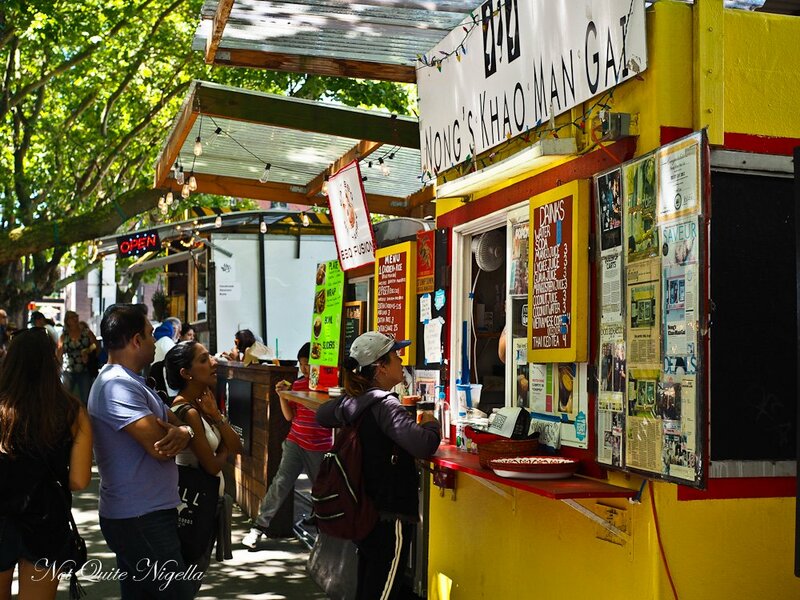 So tell me Dear Reader, do you have much of a food cart or food truck scene in your city? Do you eat from them very often? And do you have a favourite?